The Generation 1 Pokémon Internal ID list might look random, but it can be broken down into 5 different “Periods” that we are now going to analyze along with first-hand sources and vestiges in the game data, in order to produce a guide to identify some of the 40 MissingNo.’s key characteristics. During our journey, we will also learn about the reasoning behind the design of the first Pokémon games themselves, and possibly discover connections that aren’t obvious in the final release, as many changes happened throughout the turbulent 5-year long development period. Let’s start by analyzing the first Period of Pokémon development! Period 1 (circa 1989-1991) consists of Pokémon from ID 001 (Rhydon) to ID 037 (Slowpoke), and it is inadvertently one of the least cohesive pattern-wise. Since this period is not the best representation of the inner workings of the ID list in general when compared to the following ones, our method is not fully applicable here. The Pokémon from this period are diverse as well as unorganized; moreover, the ones in the range 017-037 seem to have been heavily reworked and moved around during an unspecified point in time when they had the opportunity to reorganize things properly – this happened much earlier than the hurried 150 cut. As a result, many original P1 monsters with low scores on the first polls of 1992 disappeared without a trace. This batch of monsters was probably designed between 1989-91, between the time that the early Pokémon pitch was first drafted and pitched to Nintendo with the name Capsule Monsters, and its initially scheduled release in December 1991, before Shigeki Morimoto and Motofumi Fujiwara even joined the design team. 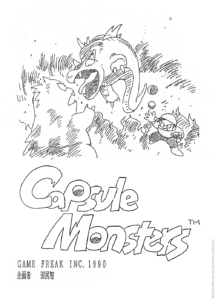 Capsule Monsters was pitched along with an illustrated booklet by the same name – yet to be revealed in its entirety – detailing the early plans and art for the first Pokémon games. Dated 1990 (both on the cover and on the Kanto layout map), this document is, however, most likely a collection of concepts that Tajiri and Sugimori had been developing for quite some time, as some inconsistencies in the contents might prove (namely plans and designs coexisting at visibly different stages of development). 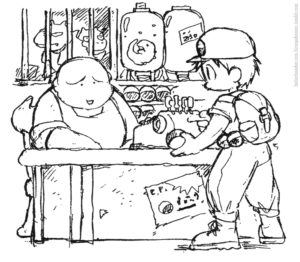 Game Freak wasn’t able to meet the December 1991 deadline, mainly because they were busy developing Jerry Boy (Smart Ball) and Yoshi around the same time. Tajiri: Right after Quinty, I thought of something similar to Pokémon. So Shigesato Itoi made something called APE with Nintendo, a collaborative company in Tokyo, And he went: “Anyone who wants to make a game with Nintendo, here’s your chance.” So I took the idea of Pokémon to Mr. Itoi and they were going to make it but they said it would take some time to complete, so they went: “Mr Yokoi of Nintendo plans on making a game about Yoshi” (…), they decided on a due date and I did the best I could in half a year. I wanted to make the best product I could despite the short amount of time. This makes Period 1 a most enigmatic and intriguing time, and the reason is simple: Satoshi Tajiri and Ken Sugimori instinctively put their passions and experiences into Capsule Monsters with complete freedom, taking inspiration from their favorite TV shows and video games like Ultraseven, The Final Fantasy Legend (SaGa), Earthbound, and Dragon Quest. Tajiri: Everything I did as a kid is kind of rolled into one–that’s what Pokémon is. Playing video games, watching TV, Ultraman with his capsule monsters–they all became ingredients for the game. Period 1a (ID 001-030, Rhydon – Tangela) specifically refers to the genesis of the games’ development, which is quite well-sourced thanks to various media, principally the aforementioned Capsule Monsters booklet. Period 1b (033-037, Growlithe – Slowpoke) is an outlier that we will discuss later on. Missingno. 031 and 032 could belong to either of these patterns; some of the evidence suggests that they were a part of P1b, although it’s not completely possible to tell with the sources that we currently have. ID 001-016 (Rhydon-Nidoqueen) forms the core of this period. 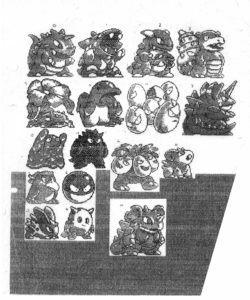 We can see them all printed on the early sprite sheet revealed by the Satoshi Tajiri manga (along with the scrapped “No.1” proto-Gyaaon). This sheet comes directly from Capsule Monsters, and it’s some of the most compelling evidence in favor of the chronological Internal ID list index method. It’s safe to assume that this was the earliest Capsule Monsters roster and some kind of confirmation is also found in a 2007 video interview, though Tajiri may have exaggerated a bit. Tajiri: It was really hard to come up with things that people would want enough to trade for them. At first, we had only made about ten, so you would get bored right away. So then it was a question of how many Pokémon you’d need for someone to be able to play without getting bored, and it felt like there was an endless road in front of us. We spent five long years making those Pokémon you’d want to trade for, until there was a whole mountain of them, and that became Pokémon as we know it now. The whole process really took a long time. These early Pokémon, or rather “Capumon”, were heavily inspired by Tajiri and Sugimori’s childhood fantasies, enthusiastically translated into their project. The title and basic concept itself was inspired by the capsules used to summon the Kaiju in Ultraseven, a detail that ultimately led to the trademark controversy that compelled Game Freak to change the title of the game. It’s easy to spot the parallels between our bulky Capumon and the Ultraseven Kaiju. We also get to meet the Capumon version of many traditional RPG mimics and monsters as Voltorb, Grimer, Tangela, and Exeggcute, along with some cute original intuitions like Kaiju-mom or having a baby rabbit-kaiju evolving into the menacing bunny eared Nido-royals that we all know and love today. Sugimori: It first started with designs of dinosaurs and monsters in a super-deformed style. they had fangs and long tails, and spikes jutting out all over their bodies. It started with Pokémon like Rhydon and Nidoking, for example. And when we looked at them all together, the designs felt rather uniform (…) as the games’ development progressed we added the idea of “types” to the game system. Sugimori: The idea came to us during development. Battles would get monotonous if there were only strong and weak Pokémon, so by affixing types to the Pokémon we were able to give the fighting more depth. The absence of typing is reflected by the fact that, even in the final, many P1 monsters have a versatile TM movepools. One surprising example is Lickitung, who can learn 35 of 55 machine moves in the game; Clefairy, Nidoking and Nidoqueen also benefit immensely from vast TM movepools. However, the Capumon pitch written by Tajiri gives us some insight about an early sorting in “categories”. Worth noting are the “Mirage monsters” (幻のモンスター) and the mysterious “Power Kings” (パワーキング). I asked if he wouldn’t mind adding 5 Powerkings, monsters with the strength you might expect to see in soldiers, and we finally struck a bargain. Powerkings have a high encounter rate, and you’ll quickly run into them if you wander around dungeons. They’re strong, though, and the theory is that, if you have a lot of them, you can put them to work as soldiers when you run into other monsters. More interviews reveal that Capumon were designed with specific roles in the human society, like “pet” or “transportation”. Those early categories, very close in style to classic RPG classes, might give us some context to understand the original purpose and conception of the first 37 Pokémon like Lapras and Clefairy. Sugimori: The first Pokémon were Rhydon, Clefairy, and Lapras. At first, we’d planned to have Pokémon living alongside humans, making their lives easier. So, during the early stages of development, many of the characters we came up with had clear roles, like carrying things around or sailing across the sea with people on their backs. We also thought up cute pet-like characters like Clefairy. Evolution, another defining Pokémon characteristic, seems to be a mechanic initially implemented as just a test. This concept would be thoroughly exploited only a couple of years later in P3. We can’t possibly tell for sure what the original relations between Gastly and Gengar, Exeggcute and Exeggutor or Rhyhorn and Rhydon were; in this phase, we can confirm evolution just for the Nidoran family as their connection can be easily inferred from their looks. The other obvious evolutions (Growlithe and Slowpoke) appear among the last additions to the period, and we’ll talk about them when discussing P1b. While types and evolutions were absent or just roughly outlined, the creators seem to have untimely fantasized about some concepts that wouldn’t be fully realized until much later – specifically gender (evidenced by the Nidoran), and perhaps even breeding as hinted at by the fetus and eggs visible in Capsule Monsters. The second half of P1a (ID 017-030, Cubone – Tangela) left us with many questions until December 2018, when NHK aired an interview with Ishihara Tsunekazu, who showed off a binder containing a second page of the original Capumon-era sprites – from Cubone to Tangela. This page included Missingno. 021, which was revealed to be a robotic kaiju Pokémon named Omega – thus concluding the mystery of “O” in the Tajiri manga poll. Omega’s empty slot was replaced by Mew near the end of development. The identities of 031 and 032 are still unknown, but the fact that they do not appear on page 2 of the Capumon pitch sprites may implicate them as part of P1b. 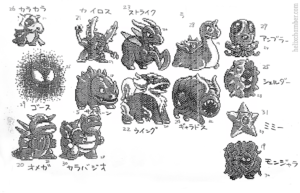 Early sketches of Lapras, Gastly, Staryu, and Blastoise appeared in other parts of the Capsule Monsters pitch document, and Sugimori himself stated that Lapras was among the first Pokémon ever designed, along with Clefairy and Rhydon (curiously enough, Lapras was index number 19 from the start, which isn’t exactly that early). Some other P1a Pokémon are visible or referenced to in the two poll documents available. Almost all of the sprites from this era underwent changes at a later, undefined point in development. Arcanine, Gyarados, and Scyther went through the most significant design rehauls later in development. Of particular note is how some of these Pokémon’s earlier incarnations better fit Capumon’s theming and its leaning towards more popular RPG elements. Gyarados is reminiscent of worm enemies from many other games, especially Final Fantasy; Arcanine is a kirin from Chinese and Japanese mythology, with hooves and no stripes; Scyther is a dragon with sickle-shaped arms that appears similar to Dragon4 from some of the mockup pages; Omega is a Mechagodzilla-like robot, which has some interesting implications since the idea of a fully artificial, animal-like Pokémon wasn’t really explored until Genesect in Generation V – a resurrected ancient Pokémon placed in a robotic body. The original designs lean more towards popular designs rather then original creatures, and were updated down the road to make the world of Pokémon much more interesting and unique. Like many others earlier in development, many of the second page Capumon were originally standalone creatures that were later split into a two-Pokémon evolutionary line. Cubone didn’t change much, but its sprite was larger and its body was rounder. (Legends told that it once rivaled Fat Pikachu in adorableness.) Rhyhorn may or may not have been connected to Rhydon yet, but it had a much smoother body and an uncanny grin. Shellder is using a primitive, less pointy Cloyster sprite (but still has Shellder’s name.) Whether the developers had made a connection between Shellder and Slowbro at this point is still unknown. Tentacool here was called “Ambler” and had a more tentacled, beaked body that became simplified once Tentacruel came into the picture. You can tell that its sprite was resized down for this; whether Shellder’s sprite was also shrunken is still a mystery, as we don’t know how it came into the picture. A note about Gyarados: Sugimori claimed that at some point the rival was supposed to be a Gyarados trainer and his name was supposed to be “Gyarao”. This statement is as mysterious as it gets…. picture Green standing next to a huge tardigrade/lamprey creature. Another defining characteristic of a P1 Pokémon is that the vast majority of them have default base cries (pitch and length values of 0 and 128 respectively, we discuss that topic further in our article about cries). However, a bunch of base cries are not assigned to any Pokémon in the final build, hinting towards lost P1 owners. How many Capumon are missing? Why are there 38 base cries and only 37 P1 Pokémon? Sadly, we don’t have enough documents to answer these questions, but we will sum up our musings in the Missingno. Summary and the Lost Pokémon dossier at the end of the series. In this Capumon mockup, you can clearly see three “capsules”, is a Voltorb among them? Typical RPG monsters, Grimer and Gastly are two reiterations of very common RPG monsters, namely the slime monster and the gas cloud/ghost, along with the “Green Dragon” only mentioned in the pitch. Mimics and other typical RPG monsters are also present among the 37 Capumon, like Voltorb, probably added as soon as the early Pokéballs (“Capsules”) were implemented in the gameplay as an item-holding icon, in order to mimic them. Even Tangela, Exeggcute and Exeggutor might have been envisioned as mimics in some peculiar locations. Gengar embodies the concept of mimic quite literally, seeing as its name and design are inspired by doppelgangers. Kaiju and dinosaur-like monsters, “Gyaasu”, Nidoking, Nidoqueen, Kangaskhan, “Ivysaur”, Rhydon, Rhyhorn, Staryu, Omega, and Blastoise are all descendants of very important Kaiju in the Godzilla and Ultraman franchise. The common fauna monsters, Cubone might’ve inhabited the Desert location, Gastly’s habitat would have probably been the cemetery. Spearow is a common bird, while Tentacool and Shellder were supposed to inhabit the sea, rivers and lakes of proto-Kanto. 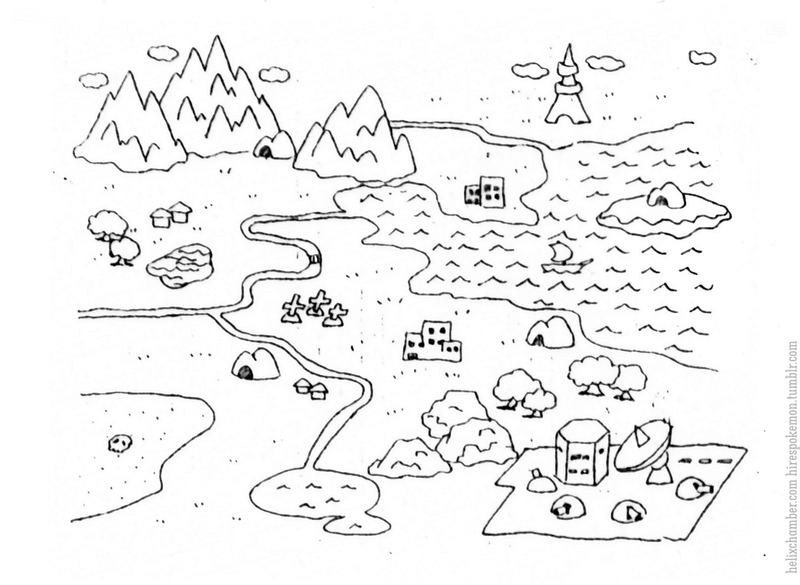 This proto-Kanto landscape was revealed in the preface to the 2018 manga about Satoshi Tajiri’s life. You can clearly see many different habitats that didn’t make it to the final (like the desert, lakes, and rivers) as well as weirdly familiar locations. The helpful monsters, Lapras, Rhyhorn, and Clefairy, were often described by the creators as monsters with a specific role in human society. 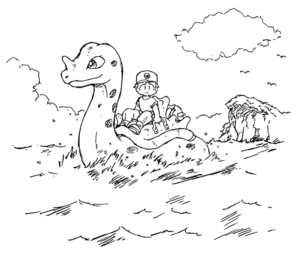 Lapras carries humans around, the early monster-ish Clefairy may be present in early sketches, and Rhyhorn is also seemingly depicted carrying some barrels on its back around a town. “Rival” Pokémon you’re not supposed to catch, “Rival monsters”, maybe “evil” counterparts, to defeat/tame. Possibly Gengar, Gastly, or Grimer? Could this be the earliest origin of Dark-type Pokémon? You were not supposed to collect every monster – the “Catch ’em all” logic was a later evolution of the concept. Power Kings パワーキング – described as “strong as soldiers” by Tajiri, they’re the most mysterious early category. We can’t possibly list any Pokémon for this yet – it’s too vague. The folklore inspired monsters, Slowbro, Lickitung, Exeggutor, Gyarados and Arcanine. The “Mirage Monsters” 幻のモンスター(Maboroshi no monsutā) sound like a predecessor to the concept of Mythical and Legendaries as Mythical Pokémon are still called “Maboroshi no pokemon” 幻のポケモン in Japanese. Arcanine would fit easily in this category, as it is based around a legendary Chinese creature, both before and after its redesign. Arcanine is even infamously referred to as “Legendary” (でんせつポケモン) in the Pokédex, and it was placed among the legendary birds in the anime and other Pokémon-related media. Gyarados was not originally based on a Chinese dragon, but its high Base Stat Total and lore make it into another candidate for an early legendary Pokémon regardless. Omega is a robot – which could easily be the only one of its kind. Perhaps these three were designed with this “category” in mind. This identification of early legendaries is pretty speculative, though, mostly because P1 is the least organized period of all, and doesn’t always follow a structured pattern. Notably, on the manga chart, P1a Pokémon are the only ones missing their index numbers (Kangaskhan is even totally misplaced). Instead, each one is marked with circled numbers that match up with their decimal Cry ID + 1. We explored this topic in our study of early development documents. As we pointed out in that article, there are a couple of puzzling exceptions in the poll chart indexing: Blastoise and Tangela’s current cries are 18 (0x12) and 19 (0x13), which would suggest that they should be labeled 19 and 20. Instead, they are labeled 35 and 37, respectively. This could hint at a temporary re-indexing of the early portion of the ID list or a change in the cry list. Perhaps Blastoise and Tangela (along with Pinsir who’s most commonly grouped together with them) were actually placed in slots 035 to 037 in the index list at some middle point, but they were moved back to slots 28 and 30 (their original places) after some earlier monsters had been deleted. Our hypothesis is that, in the final game, the resulting empty slots might’ve been partially re-filled with Pokémon like Growlithe, Fearow, Pidgey, and Slowpoke. Interestingly, despite the evidence for these changes in the mid-30s’ slots, Omega (who was marked for deletion/revision in the Tajiri manga poll) had an empty slot that seemed to have been left alone until the very end, when Mew took its place. That brings us to Period 1b and the consideration that some of these 5 Pokémon indeed feel like a later addition. If anything, Onix and Slowpoke are suspected to belong to the earliest P1 revision: Onix because its sprite style looks similar in style to Blastoise’s and Pinsir’s, already finalized by P2, and Slowpoke being tied with Shellder and Slowbro concept-wise and listed in the Game Informer list with its final Cry ID position – that would make it one of very few Pokémon in Period 1 with a clear evolutionary relation, along with the Nidoran and (possibly) Rhydon lines. Another clue that might prove most of them took the place of pre-existing Capumon is that, unlike the vast majority of Pokémon in the ID range 001-037 that have a unique base cry with default parameters (00, 128), these Pokémon have different values or a shared base cry among the first 37. By cross-referencing the sources, we can separate the exceptions (i.e. Voltorb and Gengar, which probably had modified base cries from the beginning) from the actually dubious ones. In fact, it turns out that Onix, Growlithe, Pidgey, and Fearow are nowhere to be seen in the documents dating 1989 – 1993. These later refillings of the slots might have happened as late as P4, as Growlithe could suggest. Pidgey’s base cry wasn’t even originally assigned to it, but was originally used by Clefairy before switching it to a sweeter sounding base cry that – we now know – was originally designed for Cubone. This used to be one of the two instances of a shared base cry in P1a, the other one being Staryu and Mew, who replaced Omega. Pokémon designed by Sugimori and Tajiri As the early Capumon documents were illustrated just by Ken Sugimori, should we assume Period 1 MissingNo. were also designed by Sugimori with Tajiri’s directions? The sprites indeed show some early Sugimori traits, such as big eyes, a “horror vacui” approach to the size limitations, and an Akira Toriyama-esque style. No clear typing P1 Pokémon were not designed with a specific typing in mind. The typing mechanics were added later. Mostly one-stagers Most of the Pokémon are single-stage at this point, and there are no three-stage lines. Pokémon who have evolutionary lines in the final were not necessarily meant to have one yet at this point. Kaiju and dinosaur-like monsters “Gyaoon”, Omega, Nidoking, Nidoqueen, Kangaskhan, “Ivysaur”, Rhydon, Rhyhorn, Staryu, and Blastoise. Typical RPG monsters Mimics and other typical RPG monsters like Voltorb, Tangela, Exeggcute, Grimer, and Gastly. Helpful and pet monsters Lapras, Clefairy, Rhydon, Rhyhorn. Folklore inspired monsters Arcanine, Exeggutor, Scyther, Lickitung, Slowbro. Common fauna Pokémon created along with the proto-Kanto map, designed to populate the different environments like Cubone, Gyarados, Gastly, Spearow, Tentacool, Shellder, Pinsir, and Scyther. Mirage Monsters Legendary or Mythical Pokémon were a thing even in the concept stage, perhaps not meant to be caught or even seen. Possibly Arcanine, Scyther, and Gyarados? “Rival” Pokémon you’re not supposed to catch Possible “evil” counterparts. Possibly Gengar and Grimer? The “Catch’em all” slogan was a later invention. Monsters with a base cry Most of the Pokémon in this period have cries with pitch and length parameters set at 0 and 128 respectively, which makes us think that these were the default values – and in turn, that each base cry was designed for a specific monster. Most of these monsters appear in Period 1, suggesting that cries were, for the most part, programmed during that period. Monsters with a versatile TM movepool Many of the Pokémon, especially within the first half of P1a, have access to a vast number of technical machine moves, overshadowing many Pokémon added later in that regard. Some Capumon and placeholder monsters featured in the earlier documents don’t appear in the final list or may be archaic, vaguer versions of final designs, like Dragon4 or the many “Rhino” monsters you’ve seen in these pages. You can find out more about them in our Lost Pokémon dossier. Onix, a P1b Pokémon (so suspected to be a later addition) is one of five fully evolved Pokémon in the Generation I games that cannot learn Hyper Beam. The other four are Hitmonchan, Hitmonlee, Farfetch’d and Ditto. It would be strange for this oddity to be a result of deliberate design. Onix’s stats are very low as it is, contrasting with its appearance. Hyper Beam would be an awfully weak move with Onix’s Attack stat, but why take away that option? What’s notable is that – apart from the Hitmons – all of the aforementioned Pokémon received evolved forms in the Gold and Silver prototypes. Animon and Madame were never fully realized, but Steelix survived into the final games. Presence of these Pokémon in a game that directly followed Red, Green and Blue could suggest that they were supposed to appear in Generation I in some form – of course, it would be a stretch to say that Steelix was there as a Steel-type, but an Onix evolution can’t be ruled out to have occupied the index list at some point. The 2018 Yomiuri interview about Pikachu’s origins with Sugimori, Nishida and Nishino. Edited and translated both by Pokemon.com and by Sato on Siliconera.com. This is the famous interview where Gorochu was revealed; we recommend reading both translations as the editing is quite different and each one features some exclusive insights. GameInformer Pokémon dossier and video interviews with Ohmori and Masuda. Iwata Asks, with Morimoto and Ishihara. Nintendo.co.jp interview with the creators (JP) and Glitterberri’s translation. The 2004 Game Center CX interview with Satoshi Tajiri is available in the Game Center CX DVD Box 3 on Amazon , you can read an overview on the episode on Crunck games GCCX episode guide S1 Pokémon special . 1999, TIME interview with Satoshi Tajiri. 1997, Game Staff List Association Japan interview with the creators, and Glitterberri’s translation. Shogakukan, Manga Special about the life of Tajiri Satoshi. Crystal_ ‘s thorough analysis of the Missingno. Glitterberri’s dossiers about Capsule Monsters and the genesis of the Pokémon games. It’s so wild that p1a-part2 got leaked wholesale this week like that 0_o Tho that list had Cloyster, not Shellder…weird. And even with Omega, one slot is unknown/a dud? Perhaps Omega was one of the mysterious ‘Power Kings’ of early Capumon… and by proxy, should that be true, the last remnant of the concept. While it would have potentially been one-of-a-kid, it’s equally likely that it could have been a mass-produced Mon, and certainly looks like it would have been utilized as a soldier. 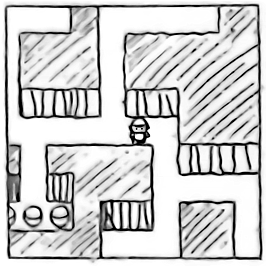 I can see a bunch of them being on guard at the high-tech location in the lower-right hand corner of proto-Kanto, designed to wipe the floor with the team of the poor schmuck who decided it was a good idea to infiltrate a sensitive area. The player, of course, would need to run away from encounters with them until they had the power to confront and defeat/capture them. Another theory – can’t believe I forgot this one! Perhaps your rival taking the starter Pokemon strong against yours – or even the concept of starter Pokemon in general – was what Capumon’s concept of ‘Rival Pokemon’ eventually evolved into. Of course, as the ‘gotta catch ’em all’ mantra was established for the series, the idea of having a completely unobtainable Pokemon was not gonna work out, so GF thought up of the current system, reasoning that kids could trade for the starters they didn’t get. Perhaps this idea also played into Gladion and Type:Null/Silvally 20+ years later. Also something, maybe your rival having Gyarados on his team should you not choose Charizard (resulting in him getting Blastoise) was a holdover from when Giant Leech Gyarados was your rival’s signature Pokemon.